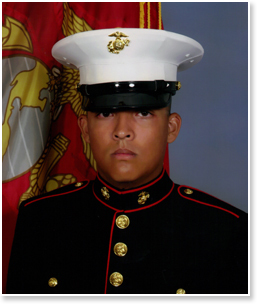 The Round Lake Area Exchange Club is pleased to announce that U.S. Marine, Private Luis Huaracha is the Hometown Hero for November. Luis is a 2010 graduate from Grayslake North High School and resident of the Village of Round Lake Beach. According to the Exchange Club’s Americanism Hometown Hero Project Chair, Sherry Ridge, “Luis has finished his basic training, came home for a few days, and is now back in California to continue his training. His sister, Laura, registered him and his “Hanging with the Heroes” care package will be filled with chips, pretzels, popcorn, candy and, of course, letters from Round Lake Area School District 116 students. He is the RLA Exchange Club’s second Hometown Hero and BEST, Bringing Everyone’s Strengths Together, is this month’s sponsor. Any and all military personnel serving overseas or in the USA from any of the Round Lake Areas, Hainesville, Fox Lake or Ingleside qualify for the program. Five minutes is all it takes to get them registered. If you have a neighbor, family member, friend, employee, employer, etc. serving in the military please register them by going to www.rlaexchange.org/hero. We look forward to announcing the December Hometown Hero. For more information visit the web site or you can contact Sherry Ridge at 847-740-2379. For more information click here or contact Sherry Ridge at 847-740-2379.